The Koh-I-Noor or Moutain of Light, is the oldest of all famous diamonds, although not of diamond jewelry. The diamond has been known to be in the possession of Rajahs of Malwa since 1304 and when Sultan Babur invaded India two centuries later, it fell into the hands of the Mogul emperors. The 5th Mughal Emperor of India, Shah Jahan set the Koh-I-Noor in the Peacock Throne as the eye of the peacock. The Peacock Throne was taken to Persia after Nadir Shah, Shah of Iran and founder of the Afsharid dynasty, invaded Hindoostan in 1728. Nadir Shah was assassinated on 19 June 1747 by Fathabad in Khorasan. In the confusion of his death, the Peacock Throne was dismantled and disappeared with his treasures. The Peacock Throne and all its diamonds, among which the Koh-I-Noor, were never found again. People have told many stories about the Hope Diamond. The superstition was that the diamond had been stolen from the statue of the Hindu Goddess Sita. Offended by the sacrilege, the Goddess cursed the stone to bring misfortune and terrible deaths to its future owners. 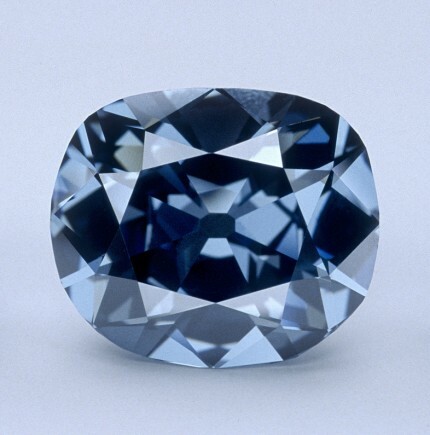 The exact provenance of the blue diamond is in fact unknown, most probably it was bought by Tavernier in 1653 from the Kollur mine in Guntur district Andhra Pradesh. However, we know from Tavernier’s sketches and notes that the diamond was triangularly shaped and weighed approximately 115 carats. The first name the diamond carried was The Tavernier Blue. Tavernier sold the diamond to Louis XIV in 1678 who had it re-cut into a 67.125 carats. It was then named: The Blue Diamond of the Crown of France or latter the French Blue, and set into a cravat pin. The next King Louis XV, set the French Blue into a pendant for the Order of the Golden Fleece. In September 1792 the Royal storehouse was robbed, most of the crown jewels were stolen. If many reappeared, including parts of the Order of the Golden Fleece jewels, the French Blue was not recovered until many years later. It is believed that King George IV of the United Kingdom had the French Blue in his possession before it appeared in 1939 in a publication of the gem collection of Henry Philip Hope. The diamond became the Blue Hope and remained in the Hope estate until 1902. The Hope Diamond passed through many hands until it was finally bought by Harry Winston who donated it a few years later to the Smithsonian Institution. 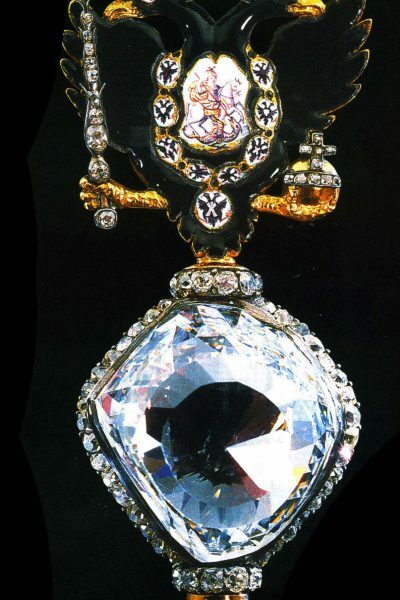 The Regent Diamond is said to have been found by a slave in the Parteal Mines on the Kistna River about 1701. The story is about a slave who stole the enormous rough concealing it in bandages covering a self-inflicted wound on the leg. As he fled to the seacoast, he revealed his secret to an English sea captain and offered to share the value of the stone if he would help him to travel safely. However on their way to Bombay, the Captain murdered the slave and sold the diamond himself to an Indian diamond merchant named Jamchund for approximately $5000. The money was very quickly spent. And one day in his delirium filled with remorse the captain hanged himself. In fact these stories remain unverified. What is known is that in 1702, Governor Thomas Pitt of Fort St George in Madras, grandfather of the American revolutionary, bought the diamond from an Indian merchant at a very high price. The diamond was then named after his owner, the Pitt Diamond. The 426 carat rough diamond was sent to England to be cut. The process took about two years and resulted in a 141 carat cushion-shaped brilliant cut and several secondary stones, some of those were sold to Tsar Peter the Great. The massive Cushion was then the largest diamond known in Europe and is still considered by many as one of the finest of the known large diamonds for its colour and clarity. It was Philip II Duke of Orleans, then Regent of France, who bought the diamond for about $650,000 on June 6th 1717. The Pitt Diamond became thus “Le Régent”, the Regent in English. It was worn by King Louis XV on many occasions, like the coronation of Louis XV on October 25th 1722 for which the Regent was temporarily in the crown. After his marriage to Maria Leczinska in 1725 he started wearing the Regent on hi-s hat. Early in the revolution, more precisely on September 17th 1792, the French Crown Jewels were stolen during the robbery of the Royal storehouse. The Regent was recovered a year later in a hole in a beam of a Paris garret. During the Directoire the Regent had been often used to secure financial transactions. Once it was passed to a Dutchman named Valenberghem as a security for several loans. Valenberghem displayed the diamond during receptions for his friends, although he admitted after returning the Regent to the French, that it had always been a replica on display and that the original Regent had never left his wife’s neck who hid it under her bodice. The Regent was permanently redeemed by Napoleon Bonaparte in 1801. Goldsmith Nitot, the founder of the House of Chaumet was commissioned to set the Regent in the two-edged sword of the Emperor. 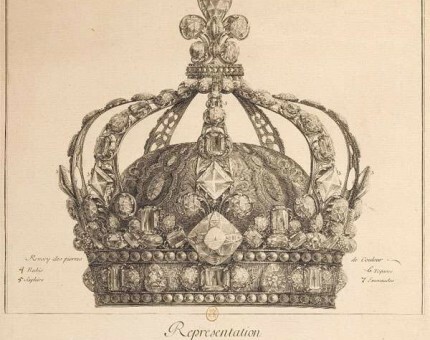 In the following regimes the Regent was mounted successively on the crowns of Louis XVIII, Charles X and Napoleon III, and finally on the Grecian diadem of Empress Eugénie. 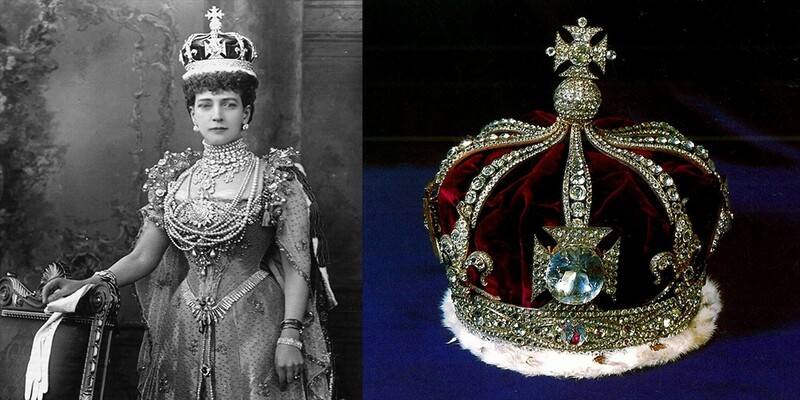 In 1883 many of the French Crown Jewels were sold by auction, however the Regent among a few others were preserved. When Paris was invaded in 1940, the diamond was sent to the Chateau de Chambord until the end of the war. The Regent was then returned to Paris and put on display at the Louvre where it remains today. on their Royal Highnesses with his large diamond; and they were surprised to see one of such largeness, and of such a fine emerald color without the help of a foil under it. We hear the gentlemen values it at £10,000." 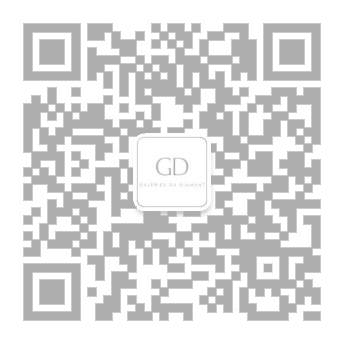 After having passed through the hands of many owners and merchants, it was Frederick Augustus II (1733-1763) who became the first royal owner of the diamond when he bought it from a Dutch merchant named Delles, at the Leipzig Fair in 1741. The Dresden Green thus gets its name from the capital of Saxony which has been its home for more than 200 years. Goldsmith Pallard in Vienna designed a Golden Fleece for King Frederick Augustus II with both the Dresden Green and the Dresden White, a 49.71 carats cushion-shaped diamond. Like all of the King’s jewels the Golden Fleece was kept in the Green Vault, a group of rooms in Dresden Castle used for the display of his collection of jewels and other treasures. In 1768 the Green Dresden was set into a hat clasp along with two other larger white brilliants, by Diessbach. The Green Dresden is still set into Diessbach’s work today and is on shown to the public in the Green Vault in Dresden. The Orlov Diamond is considered by many as the most outstanding of the treasures held within the Diamond Fund of the Moscow Kremlin. The diamond is often referred to as having the shape and proportions of the half of a hen’s egg. 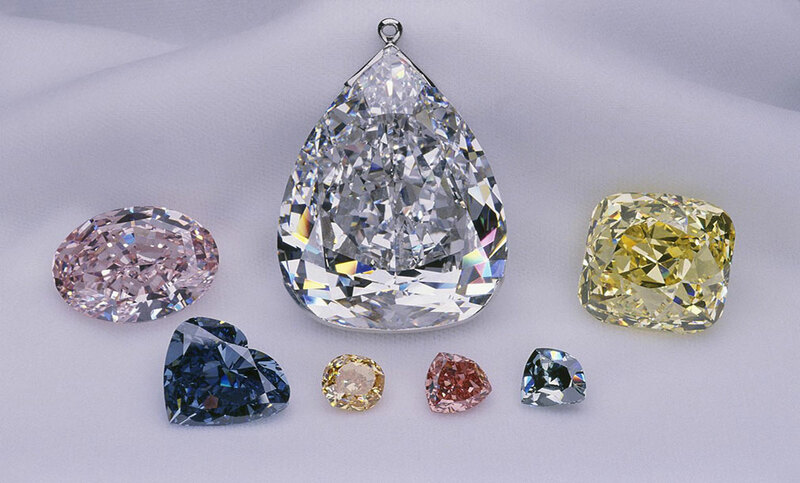 The history of the 189.62 carat diamond is rather mysterious and its origins have been lost in time. Many tales have been told about the provenance of the Orlov, the most credible, probably the following: A French deserter had heard about an incredible diamond representing the eye of the statue of the presiding deity of the Sri Ranganathaswamy Temple of Srirangam. To get closer to the statue inside the temple where no Christians were allowed, the deserter converted and disguised his intentions for many years. When he finally took action and stole the diamond from the temple, he fled to Madras, found refuge in the British Army and sold the diamond. The stone was apparently brought to Amsterdam by an Armenian merchant named Shaffrass, who met Count Grigory Grigorievich Orlov on a trip to Russia. The Count had been seeking to regain the affection of Czarina Catherine. He knew she had wished for the diamond. While his plan to revive their past romance failed, the Empress still accepted the diamond and named it after the Count. 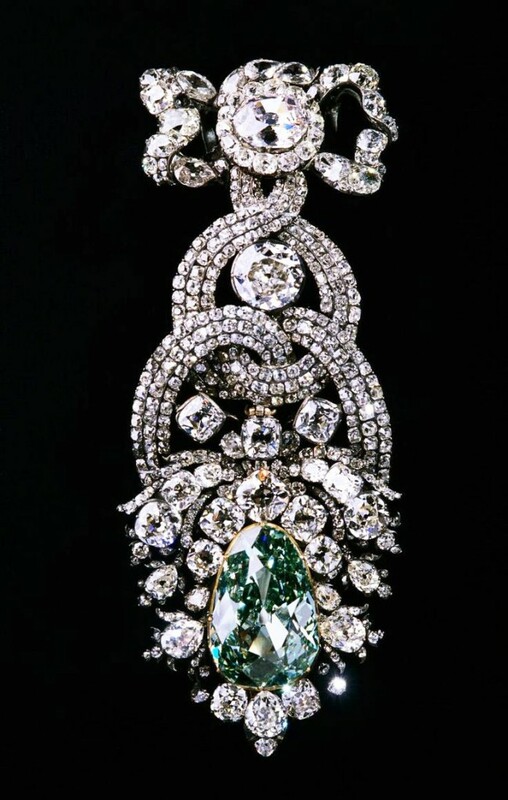 Her jeweller, Troitinski designed the imperial sceptre for the Orlov to be set in. It has been noted that the Orlov strongly resembles the description of the Great Mogul, both having a rose cut and a faint bluish tone. The Great Mogul was discovered in the Kollur mines, near Golconda in the middle of the Seventeenth century. It was named after Shah Jehan, 5th Mughal Emperor of India and is believed to have been set like the Koh-i-Nûr in the Peacock Throne. 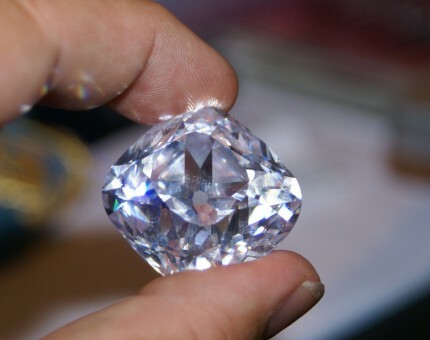 Jean Baptiste Tavernier, to whom the diamond was shown, described it as shaped like a half egg and noted a flaw on the edge (the Orlov has a surface flaw). 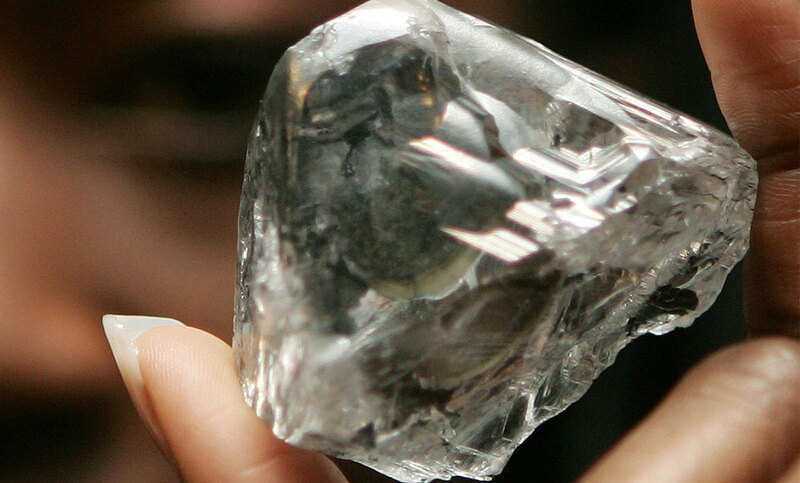 The possibility of theOrlov Diamond being the Great Mogul remains pure speculation. 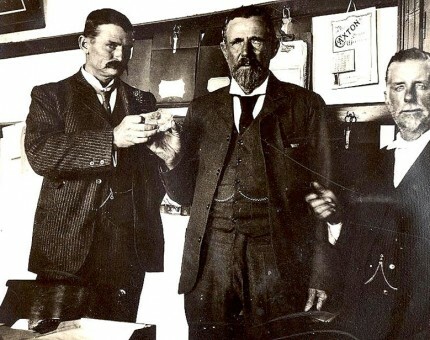 The Excelsior Diamond was found at the Jagersfontein Mine on June 30, 1893 by an African Worker who hid the 970 carats diamond from his overseer and brought it directly to the manager of the mine. As a reward he received a horse equipped with saddle and bridle and £500. Although the Excelsior’s only rival in size was the Great Mogul diamond, which had disappeared a long time ago, its discovery was not covered much in the international press. Probably one of the reasons was that its fragments once it had been cleaved were not of memorable size. The Excelsior inherited the rare blue-white tint from the Jagersfontein Mine. As this mine yielded very many “finest blue white” diamonds, the old term “Jager” was given to the particular colour stage. If at first it was thought that the “Jager” colour would be the finest of whites, surpassing the “River” colour, soon one realized that the slight blue hue was not due to the actual colour of the diamond but to fluorescence, a concentration of ultra-violet rays in natural daylight. The Excelsior was cut by the Asscher Brothers in 1902. The largest fragment of the rough diamond was a 69.80 carat marquise shape, named the Excelsior I. The diamond remained in the possession of an unknown family in the United States until it was bought by Graff Diamonds LTD. in 1989, who resold it later to an anonymous client. In 1996 jeweler Robert Mouawad bought the Excelsior I. It is said that the first time it was given a blow with the hammer, the blade broke leaving the stone unaltered. The Cullinan split on the second try. Additional cleaving resulted in nine large diamonds and 96 smaller sized diamonds. King Edward VII was given the two largest stones. The first is a 530.20-carat pear shaped diamond known as Cullinan I or Star of Africa, which is set in the British royal scepter and now resides in the Tower of London. The second, named Cullinan II is a 317.40-carat cushion-shaped diamond: the central front stone in the band of the Imperial State Crown of Great Britain. Furthermore the King bought the sixth 11.5 carat Cullinan “chip” for Queen Alexandra. The remaining larger stones were eventually bought by the Asscher Brothers and presented to Queen Mary in 1910. Cullinan III, a 94.40-carat pear drop, and Cullinan IV, a 63.60 carat cushion shape, are set together as a brooch. 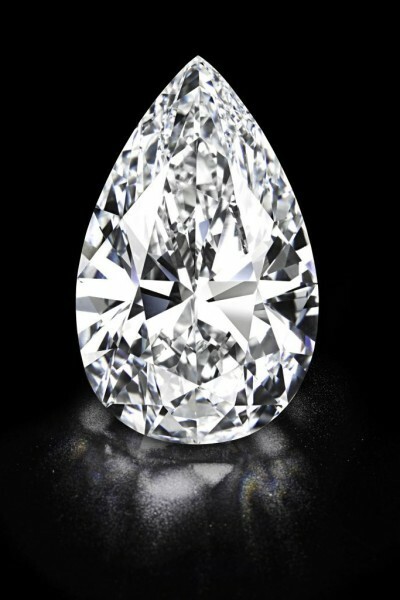 The Cullinan V is a triangular-pear cut weighing 18.80 carats. It was originally mounted in a brooch for Queen Mary, and later replaced the Koh-i-Nor in the circlet of her crown. The Cullinan VII is an 8.80 carat marquise-cut stone. It was mounted in a pendant on a small diamond brooch, in the center of which is the Cullinan VIII, a 6.80-carat cushion cut. The Cullinan IX is a 4.39 carat pear shape mounted in a ring. And history also saves space for other famous rings that will leave you in awe. The Lesotho Promise was found in the Letseng mine in Lesotho on August 22, 2006. 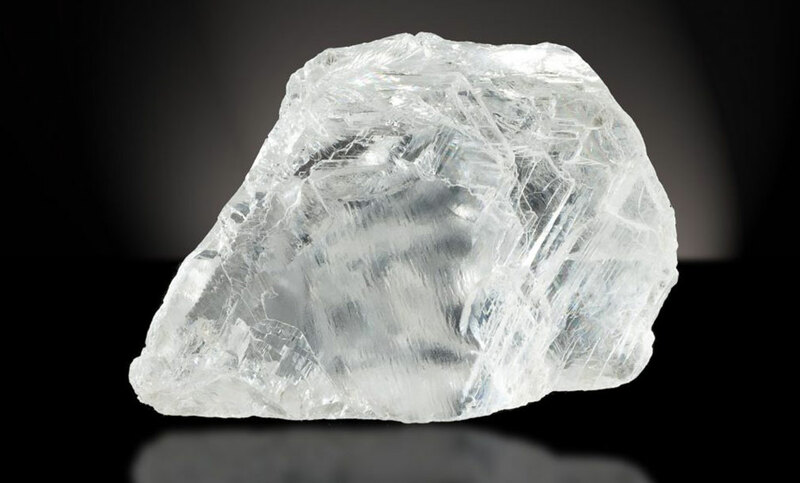 The rough stone, which was the 15th largest white diamond ever found, was sold in Antwerp for 12.36 million dollars. It was then cut as 26 separate stones and made into a necklace owned by Gaff Diamonds in London. The piece has an estimated value of 50 million dollars.